Brisbane Rail Trail sign commemorates the 125th anniversary of the opening of the Ipswich to Fernvale Rail Line on the 17th June 1884. It also recognises the contribution by the local community by the Brisbane Valley Rail Trail. In 1884, the Brisbane Valley railway line opened as far as Lowood, later continuing to Esk and eventually as far as Blackbutt, allowing fast efficient transport of produce to the markets in Brisbane and Ipswich. The Brisbane Valley Railway survived for a century, until 1989. The railway line has been removed and the Brisbane Valley Rail Trail created. The Brisbane Valley Rail Trail (BVRT) is a 148 kilometre recreation trail from Wulkuraka to Blackbutt. 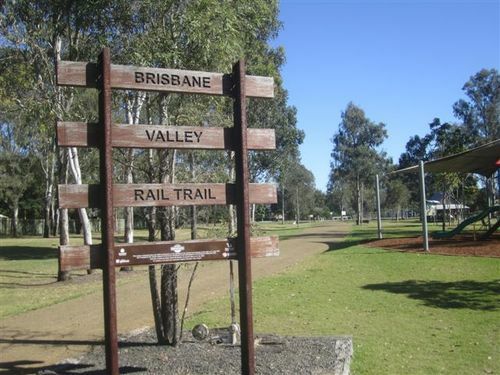 The trail follows the old Brisbane Valley railway line and is open to walkers, touring cyclists and horse riders. The trail details the history and landscape of the Brisbane Valley. This plaque commemorates the 125th anniversary of the opening of the rail line from Ispwich to Fernvale on 17 June 1884 and recognises the valued support of the local community in the development of the Brisbane Valley Rail Trail. Officially unveiled by Wayne Wendy MP, Member for Ipswich West on 13 July 2009. "An initiative of the South East Queensland Regional Recreation Trails Program"